With the growth of bayside settlements north of Sturgeon Bay, ship traffic through the channel between the Strawberry Islands, west of Chambers Island, and the mainland north of Fish Creek increased significantly. In 1866, the Lighthouse board, in response to requests from the commercial interests, asked for and received a special $12,000 appropriation from Congress to build a lighthouse on Eagle Bluff, a prominent bluff along the channel. Because of other commitments, construction of the new lighthouse was delayed until 1868. When navigation opened in 1868, a work crew arrived and landed construction supplies on the shore of Lighthouse Bay (now Tennison Bay) south of the lighthouse site. The crew cleared the site and moved the materials over the gently rising slope from the bay rather than hoisting the materials up the steep cliff in front of the station. After blasting out a basement, the masons began construction. Using cream colored Milwaukee brick they built a 26′ x 30′ two-story dwelling with an attached 12′ x 20′ kitchen wing several feet lower than the first floor. Built diagonally into the northwest corner of the dwelling, the men erected a 9′ 4″ square brick tower. Except for the construction of the top tower, the Eagle Bluff Light dwelling is almost a carbon copy of the Chambers Island Light dwelling constructed at the same time. The towers were deliberately built with different shapes so mariners could distinguish the two lighthouses during the day. A circular brick lining and cast iron spiral staircase were built inside the tower. The keeper’s family used the staircase to go between floors in the dwelling and the keeper used the staircase to reach the lantern. When the masons finished the tower, the crew hoisted up the pieces of the cast iron lantern. The lantern had been built in Detroit and was now reassembled on top of the tower. The ten-sided lantern was 7′ in diameter, 44′ from the base of the tower to the center of the ventilator ball on top of the lantern, and the focal plane of the lens was 76′ above lake level. Originally the lantern contained a 3 1/2 order Fresnel lens built in Paris, France. The light was a fixed white light of 860 candlepower, visible for 16 miles in clear weather. On the night of October 15, 1868, only about six months after the work crew arrived to begin construction, Henry Stanley, newly appointed keeper, officially exhibited the new Eagle Bluff Light for the first time. Henry Stanley was one of only three keepers that manned the Eagle Bluff Light. He served from 1868-1883. When the Lighthouse Board transferred Stanley to the new Sherwood Point Light in 1883, William Duclon became the station’s second keeper. Duclon held the post until his retirement in 1918, a total of 35 years. His replacement was Peter Coughlin who tended the light until it was automated in 1926. Although tending the light and maintaining the station always kept the keepers busy, they usually found time to entertain friends and numerous visitors. The Eagle Bluff Light was a popular place for visitors. When Coughlin retired, the lighthouse officials installed an automatic acetylene gas light in the lens. The original 3 1/2 order Fresnel lens had been replaced in 1918 by the present 5th order Fresnel lens. The dwelling was largely vacant until 1936 when the Lighthouse Service leased the dwelling and one acre of surrounding land to the state for park purposes. 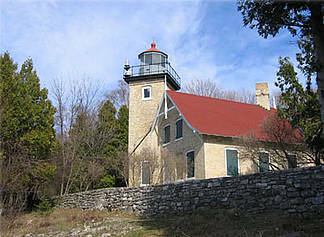 In 1960, the Door County Historical Society received permission to restore and operate the lighthouse site as a museum. After over two and a half years of restoration, Eagle Bluff Light was opened to the public in 1963. Eagle Bluff Light has once again become a popular destination for visitors. By visiting the museum, thousands of people, young and old, have been able to learn and experience what it was like to be the keeper and his family at Eagle Bluff Light in the 19th century. Eagle Bluff Light is located inside Peninsula State Park. For the official Eagle Bluff Light website, click HERE.